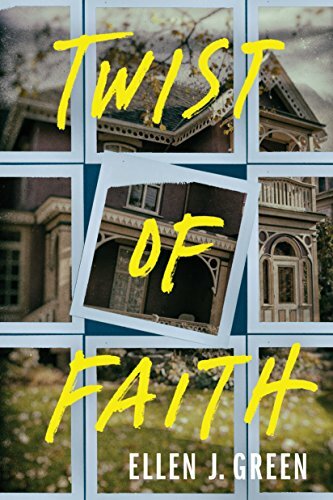 Twist of Faith is a book that immediately sets itself up to become an interesting mystery. The story is that of Ava, the adopted daughter of a woman who has recently passed away. Despite Ava’s requests, her adoptive mother has never given her any information on her origins other than to say that she had been left on the steps of the church and taken in. When her adoptive mother passes, Ava seizes the opportunity to filter through her belongings and finds a single Polaroid among the childhood belongings her mother had stored away. When she discovers that the couple who once lived at the house pictured in the Polaroid was brutally murdered five years ago, the story she’d been told for so long begins to unravel. The deeper she digs, the more strange, and dangerous, the story becomes. I wasn’t sure if I’d enjoy this book all that much. I’m usually not one for a mystery and tend to stick to my science fiction and fantasy. However, I found myself constantly wanting to read more to find out where the story was going. Green has a way with storytelling that pulled me into the story and kept me going right up through the end. They say that every good mystery has a good plot twist or two to keep the reader guessing. You’ll find that and more in this book. I truly enjoyed this book, and I think you will too. Even if, like me, you aren’t a regular mystery reader. You can pick it up at Amazon. I was really torn on this book. If I had only given it the first 100 or so pages, I would have never have gone any further. This could be why I don’t tend to try and read too many epic fantasy books. They mostly seem to start so slow and spend so much time building the world and characters without getting anywhere, or really doing much with the plot. The same is mostly true here. There’s enough of a cast of characters in the novel that we spend a great deal of time introducing them and getting backstory for each. We also spend some time, rightfully, learning a bit about the history of the world that we’re entering. Liu is a talented writer, who has a skill with prose that makes it worthwhile to continue on into the story. Eventually, after he’s done the building, and we get into the meat of the story, the characters bring you into the plot. The plot and characters really saved the book for me. This is likely to be seen as one of the better epic fantasy novels of the year, and if you’re into epic fantasy, it really should be added to your to-read list. The best way I can describe this is as a sci-fi thriller. It’s set in a near-future world where something like the UN rules the world and the diplomats that we see on the television are nothing more than faces that do and say what the rest of their committee says. By the end of the book, I found myself rooting for the main character and wanting to know more about what the future holds for her. The secondary character is just as well written. Overall, the plot and writing were well done, and the story was well executed. If you’re a fan of science fiction that takes place in a world that’s only a few degrees from the world that we live in, you should give Persona a try. I really enjoyed it, and am hoping that there’s a sequel upcoming. I’ve said this before, and I’ll say it again. I really like it when a book grabs hold of me as a reader and drags me into the story. It’s something special when a story is so well written that you jump into it and end up trying to find any extra time that you can to advance further into it. Little Black Lies was such a book. The one bad thing that I have to say about this book is that I had the ending figured out about half way through the book. But, even with that fact, I still raced through it to find out if I was right. The story is a gripping one that is fast paced and easy to read. The characters that Block has written are both believable and lovable. I’m not really sure how best to classify this book. It’s both a psychological suspense and a detective book of sorts. A mashup of genres if you want to call it that, I suppose. In the end, it’s a highly readable book in either case. This is the first book by Heitz that I’ve read. The book, along with most of the rest of Heitz’s books were originally published in his native German before being translated over into English for those of us who are mono-lingual. There’s a series that comes before this series, The Dwarves series. From what I can tell from other reviews, and from having read this book, it’s not necessary to have read any of the other books in order to read this one. The Dwarves series, as it’s name implies, tells the stories from the perspectives of the dwarves in this world, while Righteous Fury is the first in the Alfar series told from the perspective of the Alfar. The Alfar are Heitz’s version of a dark elf. At least, from what I can tell. They’re an evil race with visual similarities to the Elven race. The two main characters are Alfar who begin as rivals, but are forced to get along in order to execute on a plan that their rulers have chosen them for. From there, we’re led through a journey as they fight amongst themselves, as well as with many of the other inhabitants of the world. It’s hard for me to comment much on the actual writing of a book that’s been translated. By default, when translated, the language had to be restructured in that most languages have a different grammatical structure than English. So, I just won’t. I can comment on the structure of the story though. From a structure piece, there were a few places where it was a bit weak, and it seemed like we jumped from some dire circumstance right into the saving action. Perhaps it was necessary, but it almost felt like the story had been written into a corner and it was the most convenient way of getting it out. Overall, I enjoyed the book. It’s a well written fantasy story that doesn’t extend itself into the length of the epic tomes that seem to be dominating the market just now. I suppose it bears warning that the main characters are evil Alfar, so you’ve got to be able to get through a few grotesque descriptions and overall evilness of the people in order to really enjoy the story. Ravens is billed as a legal thriller. In that regard, I think it falls down. While it is technically set with a main character that is a lawyer, and has some legal elements in it because of that, there’s very little of it that really qualifies it as a legal thriller, in my mind. It does live up to the thriller part of that though. From very nearly the start to the end, there’s plenty of twists and turns as the characters find a way to make plans then have them tossed and turned by events. Hruska’s writing is pretty good. Some of the dialogue felt a bit flat, but overall, that characters were well rounded and easy to understand. This is a thriller, so don’t expect to get heaps of plot. You get a main issue, with a few minor plot lines and an ultimate tying up of the main plot. If you like thrillers (with a side helping of legal) that are quick reads and well done, Pardon the Ravens is worth the pickup. Of the many genre’s I read, my favorites are Science Fiction, Fantasy, and the subset of both called Apocalyptic fiction. If you look at most lists of the influential novels in those genres, you’ll most likely find Lucifer’s Hammer. That’s what convinced me that I needed to add it to my to-read list and, eventually, to get around to reading it. Having read it, I see why it’s on many of those lists. Hammer is a novel that is based around the discovery of a new comet, and the eventual meeting of that comet with planet Earth. The story follows a host of characters that are involved in some way before the comet arrives and then after it arrives. Having been written in the late 70’s, some of the ideas and references are dated, but the writing has certainly stood the test of time. Nearly the first half of the book is spent building up to the eventual impact of the comet. We meet the characters who all have their own independent lives, and are led through so many avenues of how people might feel should they be faced with a comet that is going to pass threateningly close to Earth. After the comet arrives, we get a wonderful post-apocalyptic story about the survival of the human race, and how those humans react to the upsetting of the world as they know it. Lucifer’s Hammer is a great apocalyptic story that’s maintained that story despite being almost 4 decades old. If you’re at all interested in apocalyptic fiction and haven’t read it yet, now’s the time to add it to your list. A Better World is the second book in the Brilliance Saga, a series of books about an evolution in the human race, and how the world reacts to it. It will elicit lots of comparisons to the popular X-Men comic books, although the “mutations” are not as pronounced as they are in X-Men. In a way, the evolutions in the world of Brilliance are a bit more believable. The main character, for instance, has an advanced ability to recognize patterns and use those recognitions to anticipate what it is that people are going to do before they do them. Another character has an evolved perception of time where each second for a non-brilliant is perceived as 11 seconds to him. The world, and the characters that live in it, are all believable written. Of course, there’s a certain level of suspension of belief if you’re to fully immerse yourself into the story, but that is pretty easy in this case. The plot lends itself to a quick read that draws the reader deeper until you find yourself pulling from all your spare time to finish it up and find out what happens. That’s a huge sign of a great book. If you’re a fan of well written science fiction without spaceships, or love a story with a great human story to it, the Brilliance Saga should find it’s way onto your reading list.